Nine summer school students ages 9 to 12 designed this bench with local artist James Shoop, Franconia Sculpture Park staff, teacher Amy Klein, and National Park Service Ranger Dale Cox. From the south: Hwy 35 north into downtown St. Croix Falls. Turn north on Washington Street / Hwy 87. Turn west on Massachusetts Street. Bench is on path south of the St. Croix National Scenic Riverway Visitor Center. St. Croix Falls is a beautiful place. It has a long, interesting history, diverse natural resources, and a strong community. The city’s Bench Project helped a group of students appreciate that the place they call home isn’t special by accident. Seeing their town with fresh eyes was the emphasis for the group of nine students, ranging from third to sixth graders, during an immersive two-week summer school course. 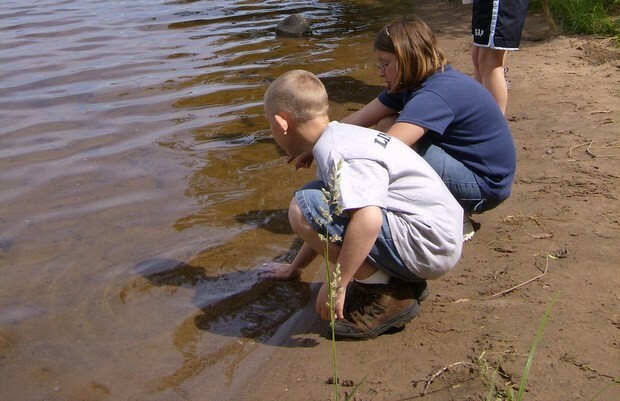 They explored the St. Croix River, the people who worked to protect it, and the things that make it unique. Then they created a piece of art that expresses their appreciation – and will for generations to come. 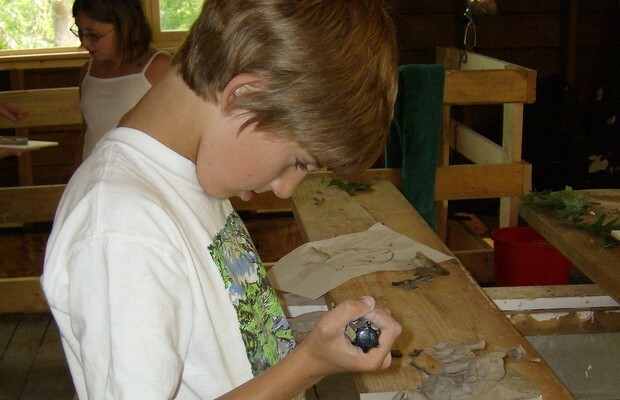 The students toured Franconia Sculpture Park, hiked part of the Ice Age National Scenic Trail, visited with National Park Service rangers, and after every activity, responded with art, writing and poetry. The class was led by Amy Klein, a teacher and then-member of the city’s Parks and Recreation Committee. “We were gathering up of ideas, and every experience built on other experiences. We talked a lot about Gaylord Nelson, what he meant, all that he contributed to preserving the St Croix,” Klein said. It was no coincidence that Nelson, former U.S. Senator and governor of Wisconsin, and considered the “Father of Earth Day,” was on their minds. As the students worked on the bench, the city was developing a new walking trail along the river to honor Nelson, who was born and raised in nearby Clear Lake and championed the 1968 Wild & Scenic Rivers Act, which protected the St. Croix. Ultimately, the bench would be placed along the Gaylord Nelson Riverwalk, and the dedication ceremony was attended by his daughter, Tia. 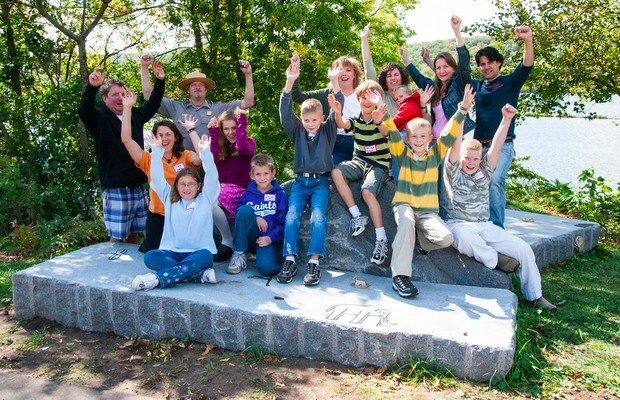 When it came time to build the bench, they used big granite slabs donated by Franconia Sculpture Park. 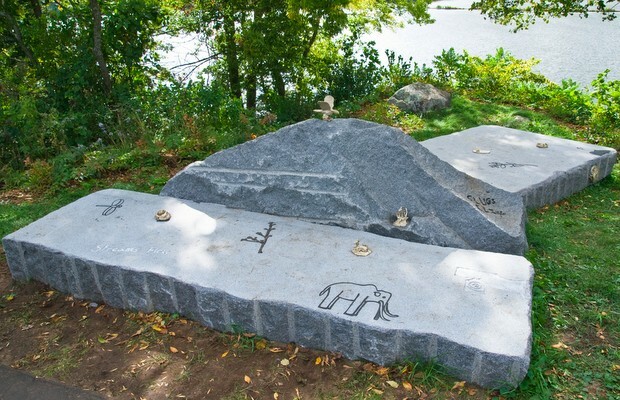 To figure out how to arrange the slabs, two groups working independently arranged smaller stones, and came up with strikingly similar designs: two stones flanking one in the middle, which represented the river and bluffs. The students also thought the bench should be circular so people could enjoy the views from several perspectives. Together, the rocks form the shape of a butterfly, a common sight during their explorations along the river. 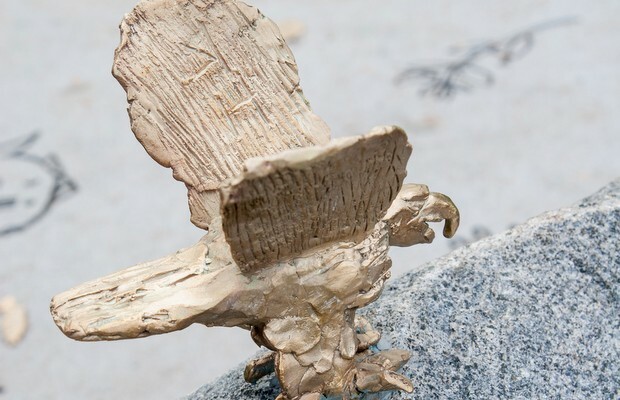 To adorn the bench with natural images representing their shared beliefs, the students turned to local artist Jim Shoop, a bronze sculptor. The students spent a day in Shoop’s studio, working with him and his wife, Kim Murphy. Each student created a clay sculpture, which became a mold and was cast in bronze. The sculptures included everything from eagles to fish, and Murphy helped the kids figure out where to place the pieces on the bench. The bench was dedicated in September 2006, at the same time as the new Gaylord Nelson Riverwalk and headquarters for the Saint Croix National Scenic Riverway. Not only was Nelson’s daughter there, but Senator, Vice President and St. Croix River champions Walter Mondale and his wife Joan also attended. Shoop and Murphy and their family visit the bench often. They live nearby and frequently ride their bikes down to enjoy the view, or have lunch. Klein works in the Osceola schools now, where she is involved in a new Bench Project. She too still enjoys the bench, especially on a sunny day. Bring colored pencils or crayons and paper and create rubbings of the line drawings etched into the stone. Then, walk around the park and find a flower, leaf, bug, or tree you find interesting. Look closely at it and draw what you see. Designed by Evan Gorres, Benjamin Hedlund, Noah Hedlund, Kody Hibbard, Daniel Horn, Henry Klein, Howard Lindahl, Madisen Neuman, Sabrina Ogren, and summer school teacher Amy Klein with coordinator Anastasia Shartin. In partnership with Franconia Sculpture Park, The Phipps Center for the Arts, St. Croix Falls Parks and Recreation Committee, St. Croix National Scenic Riverway, St. Croix Valley Community Foundation, and local artists Kim Murphy and Jim Shoop. With additional support from American Bronze Casting, Ltd., Hugh J. Andersen Foundation, and St. Croix Falls School District.